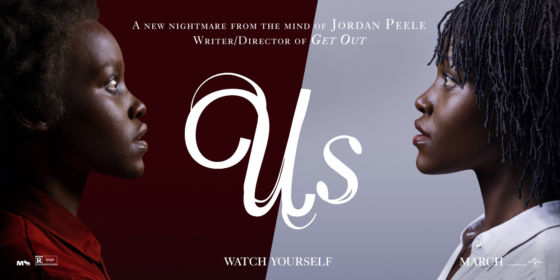 Jordan Peele’s second feature film ‘Us’ gives audiences a new reason to think critically about the information presented. Unlike his marvelous debut, Get Out (2017), Us is striking and unsettling. It’s the kind of horror movie created to make viewers question everything around them; from rabbits to scissors. Much like Peele’s first film, Us continues to explore themes of possession and observational personal horrors, in this case, a clone or doppelgänger. At the beginning of the film, a little girl named Adelaide played by Madison Curry wanders off from her parents at the Santa Cruz Boardwalk to explore an empty attraction. Among the wall of mirrors, she finds not a reflection but a physical copy of herself. After the incident, she is diagnosed with PTSD and the heartbreaking, but realistic, dead end of her parents. The plot resumes, years later, now focusing on the family of adult Adelaide (Lupita Nyong’o). Her family consists of her husband, Gabe (Winston Duke), accompanied by their two children, Zora (Shahadi Wright Joseph) and Jason (Evan Alex). The Wilson’s are returning to Santa Cruz for vacation and to catch up with old friends, but it would be an understatement to say Adelaide wasn’t suspicious about going back to the place where it all began. Things continuously begin to seem more coincidental to her liking, but she attempts to brush it off. After an incident with Jason at the Boardwalk, Adelaide lets her paranoia get the best of her. When the Wilson’s return home, Adelaide tells her husband that she doesn’t feel like herself and proceeds to tell him the story of what happened that fateful night. While telling him what happened that night, an unknown family stands in the front of their driveway. Gabe attempts to intimidate the family off of their property, but they won’t budge. Once the family comes to face to face with the Wilsons, Jason notices that it’s them, only more rabid and murderous. In red matching jumpsuits and scissors, the uncanny resemblance but differences in their “clones” are more than noticeable, and when asked who they are, the other Addie eerily responds, “We’re Americans.” The other Adelaide is only capable of speaking words in gulps and wheezes, and her family members communicate with her through hand gestures, vocal groans, and small noises. The other Addie shares the story of a girl and her “shadow” (assumingly her and the real Addie) and how she grew up in the horrible conditions living in an underground tunnel with many other clones. She further describes how everything that happened to the real Adelaide, like getting married and having children, happened to her as well, as they are “tethered”. The other family has come back up to begin the process of “detethering” and to get revenge on their real selves who have taken what they have for granted. For the remainder of the film, the Wilsons come to realize that the only way to survive is by killing their other selves. This film doesn’t compare to Peele’s first film, but with what is given, and the plot hole presented, it evolves from theme to theme. Mostly because it envelops you into the film’s mystery and separation from time to time. The overall view of this movie is to look deeper within ourselves, realizing our worst enemies are ourselves. Us came out with a loud mask of secrecy, and the less you know going in makes the movie better because you’re not spending so much energy trying to understand it, and what it means to you. Peele’s imagination and outside-the-box ideas convey a horror larger and more dangerous than the film itself can visually demonstrate.